Release Poster – Warner Bros. The following is a review of ‘Creed’, a Ryan Coogler film. The boxing saga that is the story of Rocky Balboa is immensely popular, with it having been relevant and present since 1976. Interestingly, we’ve seen a Rocky-film in every decade since John G. Avildsen and Sylvester Stallone first gave the Italian Stallion an opportunity against Apollo Creed in the 1977 Academy Awards Best Picture winner. Creed is a soft reboot of the franchise set 39 years after the events of Rocky, and I was surprised to feel that it might be the best film in the Rocky Balboa-saga. Meet Adonis ‘Donnie’ Johnson Creed (played by Michael B. Jordan) the son of Apollo Creed, former Heavyweight Champion of the World. But there’s more to his story than you would think. Donnie was not born with a silver spoon in his mouth, as he came to the world as the son of an extramarital lover of Apollo. But Adonis did not know he was a Creed, until one fine day in 1998 when he met the wife of the late Apollo Creed, Mary Anne (played by Phylicia Rashad), who decided to take care of the boy who was left without a family after his biological mother had passed away. Now a Creed, Adonis would decide to follow in the footsteps of his father, much to the disapproval of his step-mother. But when he is turned down at the Delphi Boxing Academy in Los Angeles, he travels to Philadelphia to learn the true nature of boxing, and to meet an old friend of his father – Rocky Balboa (played by Sylvester Stallone), who is as alone in the world as Adonis could ever feel. As you can imagine, there is a strong emotional current at the base of the story. The director and co-screenwriter, Ryan Coogler, clearly understands this saga, as he masterfully brings forth some of the most emotional moments in the entire Rocky-franchise, as well as Sylvester Stallone’s best performance ever. I honestly don’t think I’ve ever seen him better. Stallone masterfully exudes the right charm and emotion that the character needs at that state in his life, and Coogler points the Italian Stallion in the right direction for Stallone to affect you in the most powerful way possible. He strikes you at your emotional center simply by being who he has always been through the twists and turns of life. Stallone acts opposite Michael B. Jordan who has now become the new leading man of the franchise if the producers choose to make Adonis’ career into a series of films, which they definitely should. Jordan is a compelling leading man, and he is wonderful in his scenes with Sylvester Stallone and Tessa Thompson, who plays Adonis’ love interest. Jordan has great chemistry with both Thompson and Stallone, and is as good when he is in the boxing ring. I’ve already committed the blasphemous act of announcing that Creed might be the best film in the franchise, and allow me to make another – the boxing scenes have never felt more exhilarating. Ryan Coogler and his director of photography, Maryse Alberti, masterfully make us hold our breaths from the first to the last round of every fight. They capture the right emotion of an underdog, while still granting us hope and belief. And Maryse Alberti truly shines when the crew makes the choice to incorporate some memorable long takes, including one that takes us through the entirety of Adonis’ first real fight – stunning camerawork. Now, if I were to nitpick I would say that you could make the argument that the film touches on the exact same beats that the original Rocky-plot did, but the emotional undercurrent is starkly different, and works much better than the romance in the original film. Also, while Apollo Creed was the memorable boxing antagonist of Rocky Balboa, this film does not present any opponent worthy of sharing the screen with Stallone and Jordan. Andre Ward, Tony Bellew, and Gabriel Rosado are great fighters, but you need a true actor to really give us a Creed vs. Balboa-superfight for a new generation. All in all, Creed was everything I wanted and much more. I anticipated that it would be a good film – but it might be my favorite sports drama. Creed is a stunning film, and its stars are here to stay. 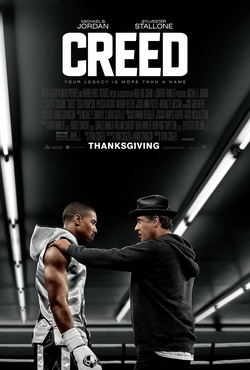 Final Score: 9 out of 10 – Creed is exhilarating, emotional, and exceptional. It might be the best film in the Rocky-franchise.